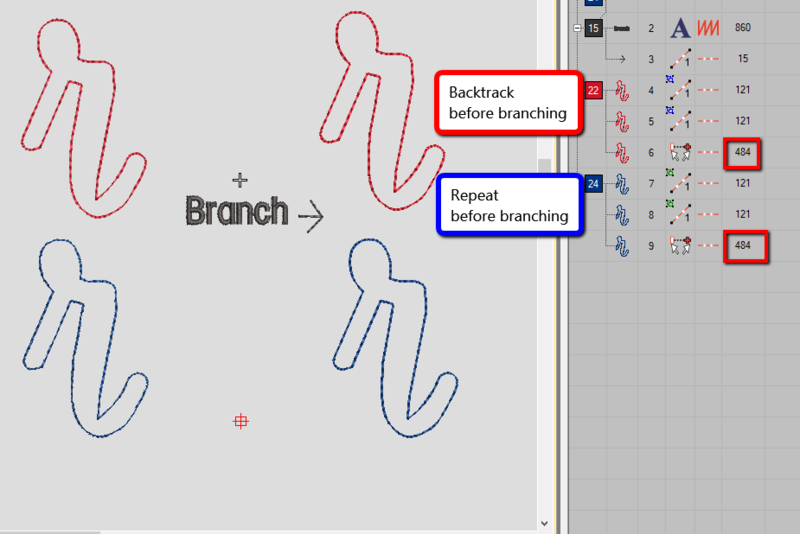 Using Branching tool on Backtrack & Repeat runs quadruples the stitch count! 2 months 1 week ago	#1613 by Pascale R.
Using Branching tool on Backtrack & Repeat runs quadruples the stitch count! was created by Pascale R.
I have an object consisting of a simple single run pass (121 stitches). To replicate the other stitching in the design, I need to make it a double pass. To do this, I selected the object and used the repeat tool. This created 2 objects (each object has 121 stitches). I wanted to consolidate the two objects into a single object, so I selected both and used the Branching tool. All the start & end points were at the same location. The resulting branched object has 484 stitches (4 passes instead of 2). I also used the backtrack tool and got the same results. Since this was a simple shape, I thought the branched object would have around 242 stitches (121 + 121), so I was surprised to see that the branched object generated 484 stitches. Is this expected? Am I overlooking something obvious again? Replied by antony on topic Using Branching tool on Backtrack & Repeat runs quadruples the stitch count! This could be a bug. In simple cases like this, I don't usually run Branch. Just the old fashioned Closest Join. 2 months 1 week ago	#1638 by Pascale R.
Replied by Pascale R. on topic Using Branching tool on Backtrack & Repeat runs quadruples the stitch count! antony wrote: This could be a bug. 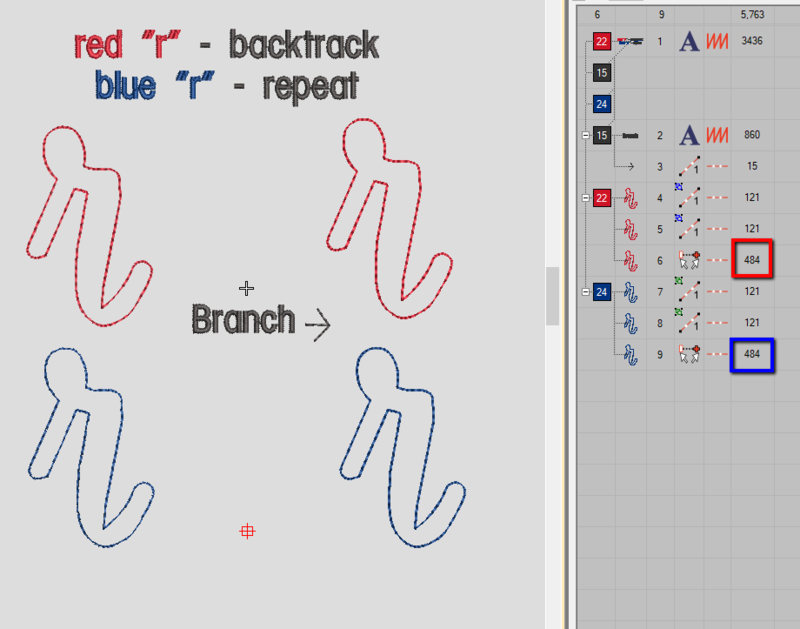 I was trying to decrease the number of objects in the design (applique name with many letters, hence many placement & tack down objects to resequence) and thought perhaps the branching tool would be a solution. I would guess that the key focus of Branching is to cover all stitches, and to eliminate as many as trims possible. And using less stitches is not the top priority. Thank about it, in many situations, a few more running stitches underneath won't hurt much since those stitches are covered under satin/tatami. Branching does the job, but you (Pascale) can do better! 2 months 1 week ago	#1648 by Pascale R.
Replied by Hong on topic Using Branching tool on Backtrack & Repeat runs quadruples the stitch count! Yes, that's expected result. If you don't backtrack or repeat the single run object, branching it with the same entry and exit points will double the stitch count.